We’d love your help. Let us know what’s wrong with this preview of Stones by L.C. Conn.
To ask other readers questions about Stones, please sign up. I am a big fan of the One True Child Series by L.C. Conn, so I was really excited to get by hands on book 5, Stones. The teen fiction series is so engaging and exciting, with a unique take of the good s evil narrative, and in book 5 Conn has really pushed her imagination and creativity to the next level. We are back once again with her strong protagonist Claire as she struggles with the news that her beloved Uncle Geoff (the man that taught her to embrace her gifts) is seriously ill. But, she ha I am a big fan of the One True Child Series by L.C. Conn, so I was really excited to get by hands on book 5, Stones. The teen fiction series is so engaging and exciting, with a unique take of the good s evil narrative, and in book 5 Conn has really pushed her imagination and creativity to the next level. We are back once again with her strong protagonist Claire as she struggles with the news that her beloved Uncle Geoff (the man that taught her to embrace her gifts) is seriously ill. But, she has much more than just this to deal with, another epic battle between good vs. evil is coming and this time there is a lot more at stake for Claire. Marcus Ryder has her daughter, and she is in danger. Can Claire face this next battle and emerge victorious, and what role to the watchful stones in Scotland have to play? Like all the books in the One True Child series, Stones was a real page-turner, with beautiful scene-setting and a fantastic plot. Bring on book 6. New Zealand born Australian author L.C. Conn has discovered that cosmic glow that allows her reader to make sense of the order of the universe, all in the format of a coming of age story. L.C. is a mother who is battling breast cancer and has transformed her life situation into a significant epic - the One True Child Series - which proves to be not only a sensitive examination of the coming of age time of each of our lives, but takes that discovery/recognition sequence into the realm of philosophy, a survey of good versus evil/chaos versus order and the permutations those poles have on each of us. And she manages to tie this all together in the form of young lass Carling. Conn tells a narrative of the battle of good versus evil in one of the most scintillating tales ever. The fact that she sets the mysterious place in the book in New Zealand and the highlands of Scotland gives the fictional story a real presence to which it is easy to relate. Conn constructs her characters carefully within a family setting to give that close, lifelike feeling to the characters in an enchanting story. Conn’s writing is drawn from both the inspiration of a dream and her real-life ex Conn tells a narrative of the battle of good versus evil in one of the most scintillating tales ever. The fact that she sets the mysterious place in the book in New Zealand and the highlands of Scotland gives the fictional story a real presence to which it is easy to relate. Conn constructs her characters carefully within a family setting to give that close, lifelike feeling to the characters in an enchanting story. Conn’s writing is drawn from both the inspiration of a dream and her real-life experience having lived in a small town in New Zealand before moving to Australia. Therefore, the way she tells the story of having to face the worst fear of a parent is quite thrilling and chilling, especially for a new parent. I could draw inspiration to face my fears from the way the main character fights through her life challenges while drawing from the love of her family to survive. Starts out with Claire and she's married to Matt and they have a young daughter: Brianna. Her uncle Geoff is very ill and it's amazing the daughter tells them they must go see him, for the last time. The young daughter has powers she has no idea about yet-she can see into the future. Her uncle had raised Claire in Scotland as they pack up and get ready to go. As time goes on others on the evil side kidnap some for leverage. Some are able to read their minds also, some can block them. Claire also has to heal others and some know her other secret. The kids are safe and others are trying to find them and return them to the rightful parents. Enjoying this story although I've missed the other 4 ahead of it so am a bit in the dark about some things but it's still a good story-not really my genre but finding it interesting enough to keep going. Like what the meaning of the title is to this book-so very important place for them all. Mind games so severe it brings others to the floor, so powerful. Love how the book is wrapped up at the end. Other works by the author and about the author are included at the end. I received this review copy from the author and this is my honest opinion. With a flair of mystique and charm, L. C. Conn continues Claire Drummond’s tale of stones and danger. Stones (One True Child Series Book 5) picks up with Claire, Matt, and their daughter Bree experiencing the death of her Uncle Geoff. Then shortly after that, the death of Matt’s mum in Scotland. Traveling back to Scotland brings Claire a message from Breena, Matt’s deceased sister, and the realization of little Bree’s talents. Trials and testing is coming, this time Bree is the target and the wh With a flair of mystique and charm, L. C. Conn continues Claire Drummond’s tale of stones and danger. 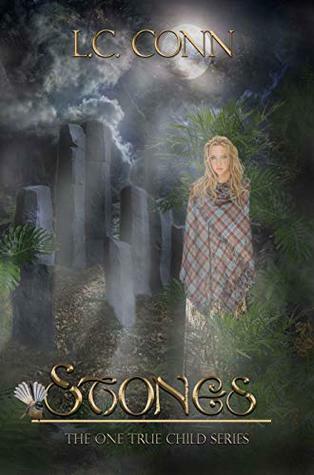 Stones (One True Child Series Book 5) picks up with Claire, Matt, and their daughter Bree experiencing the death of her Uncle Geoff. Then shortly after that, the death of Matt’s mum in Scotland. Traveling back to Scotland brings Claire a message from Breena, Matt’s deceased sister, and the realization of little Bree’s talents. Trials and testing is coming, this time Bree is the target and the whole family comes together for her protection.